Looked at a potential new-to-us boat yesterday. 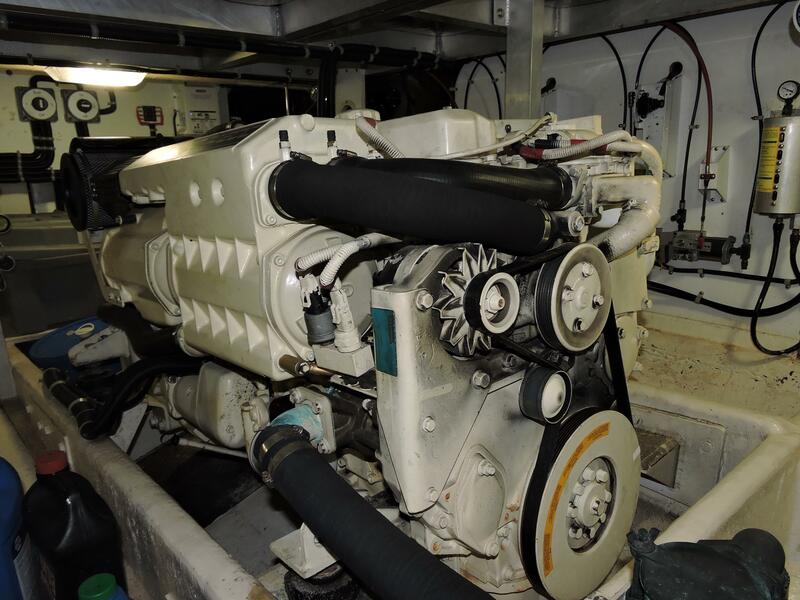 It has twin 480 hp Volvo TAMD 74P engines that look exactly like the attached photo. The raw water intake comes from the strainer to an inlet on the front starboard corner of the engine. The inlet has four mounting bolts. I suspect this is the inlet for the water pump">raw water pump and is close to but is NOT the cover for the impeller. Is that correct? Is the impeller easily accessible? Can the impeller access be seen in the attached photo? Also, the parts diagram for the heat exchanger indicates there is one zinc anode in the bottom of the front cap for the heat exchanger. It doesn't appear visible in the photo or easy to access. What is the process to change it and where are the other zincs located? Any insight and guidance would be appreciated. Re: Volvo TAMD 74P Impeller location/access? The sea water inlet pipe is attached to the body of the pump with the four bolts which you mentioned , and a clamping flange. By loosening the bolts it allows the inlet pipe to swivel and align with the hose better. But as you surmised, this isn't the pump cover to change the impeller. This impeller cover is immediately aft of the inlet elbow, and faces aft....below the heat exchanger. The access is decent if the stb engine isn't jammed against the starboard hull. In this photo the pump is painted black, thus hard to see. As you mentioned, the zinc is located in the front cover of the HE and is removed by simply unscrewing the plug that the zinc is threaded to. There will also be another similar zinc in the after-cooler end cover, which is the housing just aft of the HE. Lastly there will be a zinc in the gearbox oil cooler, normally mounted just above the gearbox. Awesome! Thanks, Doug. That helps a lot. Doesn’t sound like it’s all that difficult to do routine maintenance. Anything to beware of? Any “gotchas” for routine maintenance?